Clark has helped repair an orbiting satellite and faster than he thought it would take, leaving him time to bond with new friends with familiar faces, namely Barry Allen, Princess Diana, Arthur Curry and Bruce Wayne, aka The Flash, Wonder Woman, Aquaman and Batman. His heroic assistance builds bonds even with Bruce, though he'd be reluctant to admit it. Superman then spends the night watching over Metropolis and his old home away from home, the Daily Planet. With the city keeping him busy Clark realizes he's been caring so much for the world he almost forgot his own world, that of the Smiths and races home to Hamilton County. Lois and Jon remind Clark that it is the last night of the County Fair. To their surprise Clark swears to hang up his cape for the night and be with his family. Lois is skeptical, Jon overjoyed. The family enjoy the fair, a rare moment of relaxation and even though Jon is reluctant to speak to Kathy Branden, Lois nudges the friendship forward promising to watch the Blue Ribbon contest. Meanwhile three local thugs notice the ticket office is cash only and plot to rob it, while the Smiths approach the Hamilton Elementary booth and meet Jon's teacher Mr Martinez. While Jon's teacher sings his praises, the thugs unpack pistols and clown masks. Lois approaches the booth of the local paper The Hamilton Horn and Clark takes Jon to meet Cathy. Clark literally bumps into one of the thugs and is taken aback by the clown's rudeness. His suspicions lead to a quick glimpse with x-ray vision, and super hearing, both of which reveal the robbery plot. But Clark remembers his promise and holds back on a 'Super' intervention. Lois meets up with a snack laden husband and tells him she's organized an interview for Clark to work on a column for the paper. They arrive just in time to see Cobb's cow win first prize and Clark apologizes for being rude when Jon had his head injury. While Kathy and Jon enjoy cotton candy Cobb introduces the Smiths to Doc Brooks, town physician. The new friends toast Cobb's winning and the fireworks display is announced, leading Clark back to watching the criminal clowns. Clark makes an excuse to slip away but dons a medieval costume from the fair rather than his Superman suit and rejoins his wife and son as they are climbing into the rollercoaster. The ticket office staff accidentally turn on their p.a system and describe how a medieval knight with heat vision foiled the clowns robbery and saved the takings. Clark may have kept his promise of no Superman rescues but Lois is unimpressed at his sneaky workaround. Still the thrill of the coaster and the awe of the fireworks serve as a great distraction! Story - 5: It is all about family this issue. No massive alien threat, no danger of planetary destruction. This time it's a celebration of all things family and even the Justice League are reduced to cameos as the Smiths take centre stage. 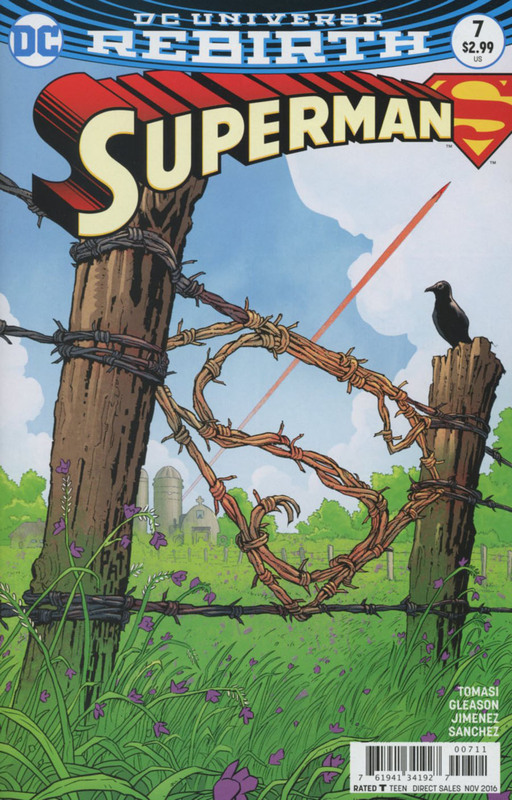 What this issue does is show that Superman can still be super, can still have an engaging story, and build on the supporting characters, and flesh out the one-dimensional ones without a stereotypical hero versus villain fight. There was a robbery of course but it wasn't shown, and in fact it needn't have been. This was a world-building story, Hamilton County was suddenly a real place, not just a name. It has a newspaper, a town doctor, a good school, and a real honest to goodness family feel that only Smallville or Midvale had been able to touch in the past. 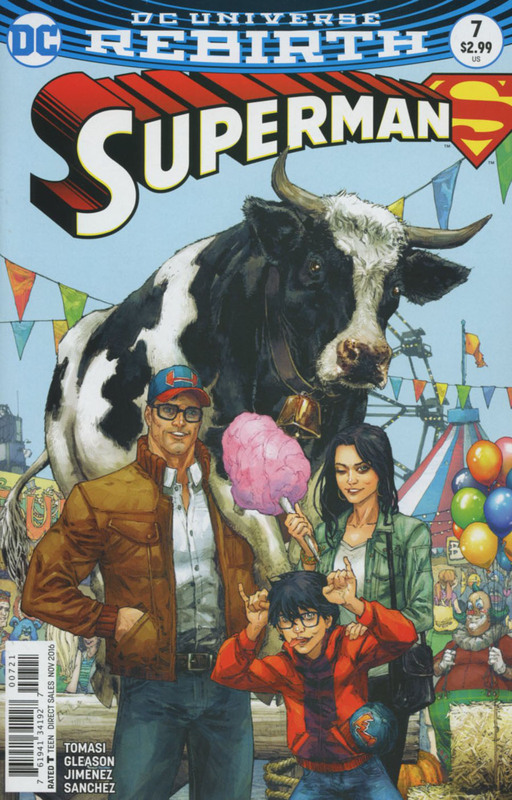 Jon is now consistent in portrayal across the Superbooks and Lois & Clark are forging a new life for themselves. The story is aptly named 'Our Town' and suddenly Hamilton County feels like exactly that. Art - 5: I've always praised Jorge Jimenez and deservedly so. This issue was far from Earth 2's 'Hollywood budget' art styling but it doesn't feel cheap. Some artists seem to struggle with Superman's new suit but the panel with Clark in space? That is Superman! Similarly, how heart warming to see the Smiths look doing simple stuff like family time? Cover Art - 3: I can see what they are going for with the cover but unlike the issue inside it just feels boring and disconnected from what the story was trying to achieve. In fact the thematics of the story make the cover a very odd choice to couple this with. Variant Cover Art - 4: Don't have a cow man... well not the focus of a cover anyway. Much preferable to the main cover but I think it would have been better to downplay the cow and focus more on the Smiths.